The killing of the Tibetan monk Akong Rinpoche in Chengdu, China in October 2013 shocked all who have had the privilege of meeting him and learning from him. His was a unique blend of quiet, unassuming humility and personal commitment to the alleviation of suffering on a grand and global scale. 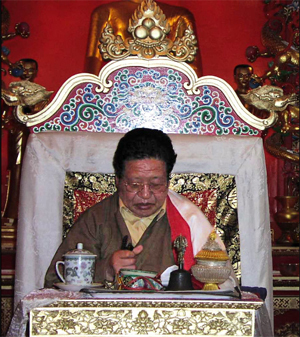 Rinpoche, a doctor of Tibetan medicine, embodied in himself the whole of the Kagyu tradition. His work was his life and his singular focus of commitment branched into effortless multi-tasking. In his workplace at Samye Ling he would move from one desk to another, offering a word here to a translator of a traditional text, a suggestion there to the architect of his next building project in Tibet, and so on round a dozen dedicated desks. He was one of the first external lecturers at the Beshara School when he was invited to address the first Six-month Course students in 1975. His riposte to the question of why there is so much suffering in the world, “Why is there I?” has become embedded in the lore of the School. But when invited to return he sent instead a more senior member of his lineage, the Tai Situpa, because Rinpoche considered him more worthy to speak than himself. Since then, when Samye Ling and Chisholme were both very new, the links between the two have been strengthened by annual visits of Chisholme’s students for an audience with Akong Rinpoche. Even though he had given up formal teaching, on the grounds that he had nothing new to say, that it had all been said and written about before by others who were far better teachers than himself, and that now it was time to actually live the teachings and engage in action, still he always found time to sit with Chisholme students and address their questions. We are profoundly grateful for his goodwill and kindness, for his teaching and example and will treasure his memory always.